The surrender of the German U-boat fleet at the end of World War II was perhaps the principal event in the war’s endgame which signified to the British people that peace really had arrived. This revised, updated and expanded new edition gives career details of not only the 33 commanders who accompanied their boats to Loch Eriboll but also of a further 23 previous commanders of those U-boats, including four who might be considered ‘Aces’ because of the damage they inflicted, sinking and disabling Allied shipping. The book also features an analysis of the Allied naval operation under which the surrendering U-boats were assembled in Scotland and Northern Ireland; asks who first contacted those U-boats after the capitulation – armed British trawlers, frigates of the Allied navies or aircraft of the Royal Air Force; and discloses how U-boats spared destruction were distributed to the navies of the USA, France, USSR and the Royal Navy. Also revealed are more unpublished recollections of British and German naval personnel present at the Loch Eriboll surrenders and how 116 surviving U-boats came to be sunk in the waters of the Western Approaches in the winter of 1945/46. 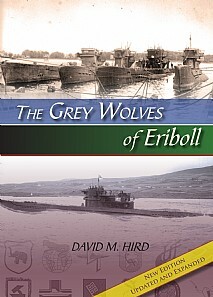 The Grey Wolves of Eriboll includes a wealth of historical insights including the German Surrender Document; detailed descriptions of the construction, service careers and circumstances of each surrendered U-boat; details of the frigates that supervised the surrenders, contemporary newspaper reports and descriptions of the naval Operations Pledge, Commonwealth, Cabal, Thankful and Deadlight, each of which involved Eriboll U-boats. The mysteries surrounding Hitler’s yacht and the alleged ‘Norwegian Royal Yacht’ (which did not exist at the time) are also explored. The pivotal role played by Loch Eriboll in ending the U-boat menace is little-known and lesser celebrated – this book rights that wrong. This long-overdue book will be of huge interest to all those interested in WWII and modern history, particularly in Scotland. It will also appeal to U-boat and submarine enthusiasts, mariners and ex-mariners and anyone with local connections.